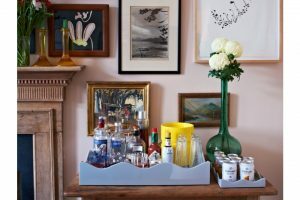 The home bar has had a potted history; towards the end of prohibition in America tea trolleys started to be used for cocktail parties. 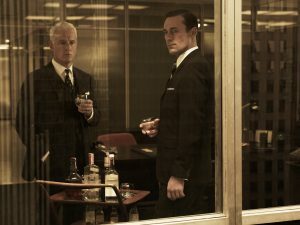 By the 1950's and 60's the trend had really caught on and home bars adorned many living rooms on both sides of the Atlantic. 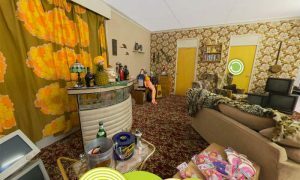 But by the 1980's the shine had warn off and owning a cocktail bar was seen as more Del-boy than Don Draper. 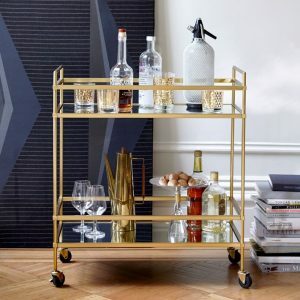 But fast forward to 2017 and as with most trends the home bar is having a revival and is quickly becoming a must-have for the stylish contemporary home. 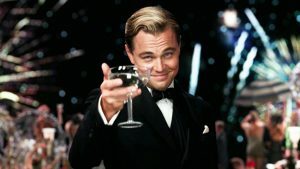 From creating a small display on a tray to a fully plumbed wet bar complete with icemaker and dishwasher there are many ways you can embrace your inner Gatsby and enjoy your very own home bar. If you want to brighten up a small unused corner of a room the perfect choice would be a butler's tray. The same principle as the tray above, but on its own legs to make it a stand alone piece. 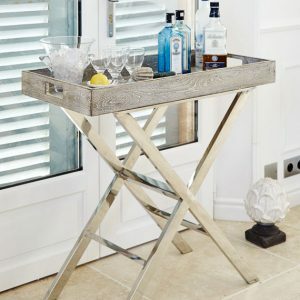 A butler's tray gives you freedom to move your party from room to room, but if you really want to be able to take the party from the sitting room to the garden with minimal fuss a drinks trolley may be the perfect solution. 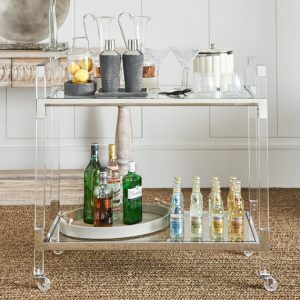 The Lenox drinks trolley from OKA at £985.00 (image above) is crafted from acrylic and glass with a stainless steel frame. 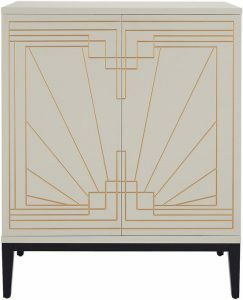 It is a stylish piece of contemporary furniture that will sit perfectly in either a dining or sitting room. 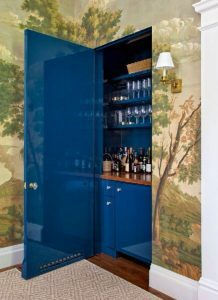 If you would like a more permanent bar the easiest solution is a freestanding cabinet. There are some stunning examples on the market today. 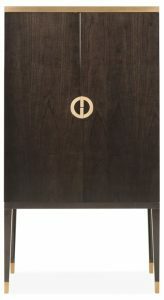 From sleek high gloss lacquer to beautifully inlaid wood there is a style to suit every home. 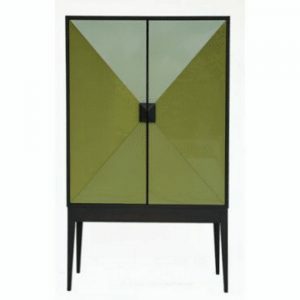 The Sugarcube cabinet by Knowles and Christou is a large cushion fronted glass cabinet with oak handles and plinth. With a starting price of £5,998.00 optional added extras can be included such as mirror back, glass rack, pull out drawer and internal lighting. 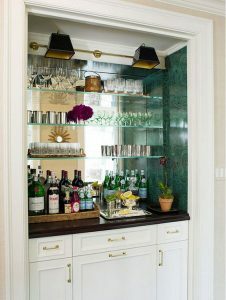 A more permanent solution is to build a wet bar in your home. 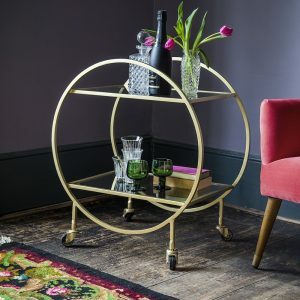 Located in the sitting room, library or main living space this can add a whole new dimension to entertaining. A wet bar includes a sink and often a slim line dishwasher and drinks fridge. 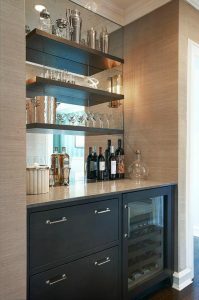 A wet bar gives the opportunity to use dramatic lighting and statement wall coverings that otherwise might be too overpowering in larger spaces. 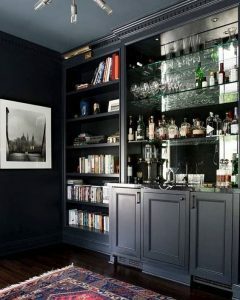 If you are inspired to build a wet bar or just to dust down the old cocktail shaker why not get in the mood and make one of these FRI favourites tonight? Fill two glasses with ice, add the ginger beer and lime juice each glass. 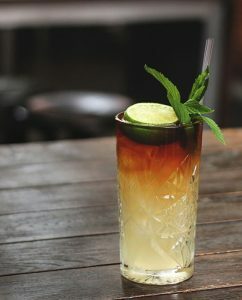 Carefully and slowly pour the spiced rum on top so it stays in a separate layer. Add a slice of lime and mint sprig and serve. In a small saucepan bring the blackberries, water and sugar to a boil, turn down low and simmer for 10 minutes. Strain the blackberries and leave the syrup to cool. 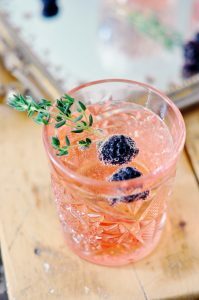 Add 2 tablespoons of blackberry syrup to each glass and top with champagne. Add a sprig of thyme and serve.